WordPress autoblogging plugins help us to keep our blog and website refresh and keep it growing. Many times we face this issue that we don’t get much of the time to maintain the blog and you should be ready to maintain your blog when you are busy. However, it is not that easy to create fresh content every day and especially when you’re too busy. Another issue is that, many of us can’t afford freelance writers to write the new content and if we can also, there is no guarantee that it will be of high quality that we expect from our blog. Recently I have started a niche blog (I’ll write the case study as for how it will perform further) and have hired a girl for the content. She is delivering the content on time but not getting the quality that I expected and so have to spend much of the time to edit that article. So another approach of this is WP Autoblog plugin. WordPress auto content generator can help you in such scenario. This WordPress autoblogging plugin allows you to generate free content for your blog. So here are the top WordPress autoblogging plugins for you to create fresh content for your blog and website. Some of these WP Autoblog plugins are free while others are paid and you’ll have to pay to have those plugins. WP RSS Aggregator is considered as one of the best autoblogging WordPress plugins and is completely free. This plugin is used for importing, merging and displaying RSS and Atom feeds on your WordPress site. With this free core version of WP RSS Aggregator, you’ll be able to aggregate as many RSS feeds from as many sources as you'd like. The most important feature that I liked about this autoblog WordPress plugin is, it is highly customizable. You can arrange the feeds as per your need. Here you can select the feed time interval and can also open the external links in the new tab and much more. • You can always export a custom RSS feed depending upon your feed sources. • It allows you to display your imported feed items with the help of a short code. • You can set the name of feed source along with the features like pagination, date format, and links as well. • You’re allowed to limit the number of feed items in the database. • It also can open video websites like Daily Motion, YouTube and Vimeo directly on your blog. • I guess the above features are enough for you to choose this plugin and if not, then here are some of the add-ons available for it. • Categories – This add-on allows you to show your content in an organized way and according to the category you wish to show first. • Full-Text RSS Feeds – It connects you to the Full-Text premium service and hence you get the unlimited feed items for every single feed. • Keyword Filtering – As the name suggests, it imports the feeds as per the keywords set by you. • Excerpts and Thumbnails – It clear by the name, the add-on shows excerpts and thumbnails with the title, date, and source as well. FeedWordPress is another free autoblogging WordPress plugin and can be helpful to create free content. The best thing that I liked about this free autoblog plugin is, here all the incoming categories will be turned into tags and if there is any new category, the system will automatically make it a new tag. If you’re looking for a decent and easy to use WordPress autoblogging plugin, I would suggest going with WPeMatico. This is quite a decent and very easy to use with lots of customization available. This plugin also offers you a nice interface like the default WordPress to manage all the feeds you import. Here you can import feeds from multiple sources and can arrange as per your need so that it can look better. WP Robot is one of the best WordPress auto content generators but it is a premium autoblogging plugin. Though it is a paid one, believe me, every penny of its worth. You will clearly identify the difference between free autoblog plugin and the paid one in terms of quality, in terms of ease of use and much more. You can use this plugin with any WordPress theme and with any version. Another important feature of WP Robot is, you can insert your affiliate links in the content. Currently, WP Robot supports more than 20 affiliate links including Amazon, eBay and much more. You can buy WP Robot just by paying a one-time fee of $89 for basic version while the full version is available at $129 and developer version at $329. Below are the features of all the plans. They also provide 14 days money back guarantee. In case you’re not satisfied with the service, you can get your money back within 14 days. Today more than one million blogs are using WP Robot. Autoblog is another excellent plugin by wpmudev which is known for their premium themes and plugins used by millions of bloggers and webmasters. A few days ago, we wrote AdSense optimized WordPress themes and many of wpmudev themes are there. It uses RSS to share blog content from around the web in a single WordPress feed. 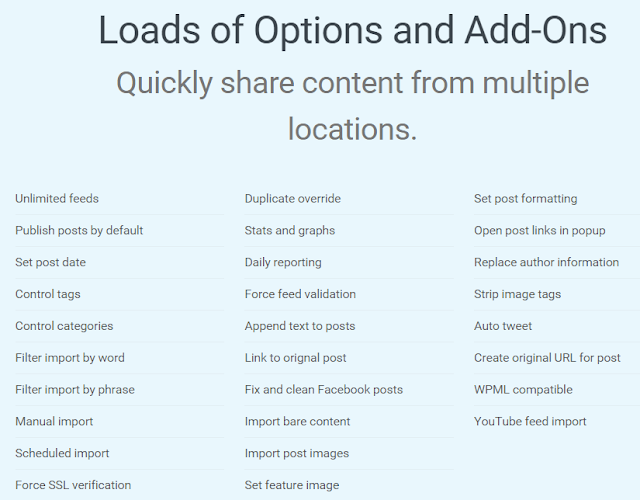 Want to repost blog content from multiple sites to one place? Automate posting to WordPress and Multisite using RSS feeds with Autoblog. Below are some of the features of Autoblog and add-on supported by Autoblog. This WordPress autoblogging plugin has been downloaded more than 63k times till now and is quite popular in the blogging community for WordPress auto poster. This support autoblog plugin is the bit costly compared to other autoblogging plugins available in the market and costs $19 per month. This includes premium support as well. Here are the few features of Autoblog WordPress autoblogging plugins. • All the controls- like tags, most used phrases etc. Wordpress automatic plugin is another premium autoblogging WordPress plugin for the bloggers and webmasters for creating contents. This plugin is from the market leader codecanyon which is the #1 marketplace for all the major themes and plugins. It is compatible with all the browsers and WordPress versions and without any issue, you can use it easily. If you are looking for an amazing WP autoblog plugin, I will suggest you go with it as it has lots of features and is most cost-effective. Wordpress automatic plugin just comes at $18 which includes premium updates and supports from developers. Buzz Burner is a paid autoblogging plugin used by multiple internet marketer and bloggers. They create some good quality of content (of course not the original) and it generates the content after running it through a translation and a spinner. Buzz will Auto Curate content and then populate this filtered content into the pages of your WordPress site. The price of Buzz Burner is $7.97 per month or $97 one time charge. If you are looking to buy this plugin then I would suggest you buy for $97 as you can use unlimited time without thinking of any monthly charges. Also, as they provide 60 days money back policy so there is no risk also. If anytime you feel that it doesn’t come to your demand, you can get your money back. These were some of the best WordPress autoblogging plugins. As mentioned some of these are free autoblog plugin while others are paid one. You can select the one which suits you. One thing that I want to mention here is, despite using any of these best autoblogging plugins, you will not get the super quality as most of these are using spinner and various other methods to generate content. But due to the competition now the quality is better and readable. So if you are short of time and need to keep your site updated, you can go with these WordPress autoblogging plugins. Do you use any auto blogger plugin for your blog?